Looking for the best of the best dividend stocks? The Canadian Dividend Aristocrats list is the perfect place to start. To be included in the Canadian Dividend Aristocrats list, a Canadian company must match the following criteria. The company’s security is a common stock or income trust listed on the Toronto Stock Exchange and a constituent of the S&P Canada BMI. The security has increased ordinary cash dividends every year for five years but can maintain the same dividend for a maximum of two consecutive years within that five year period. The float-adjusted market capitalization of the security, at the time of the review, must be at least C$ 300 million. For index additions, the company must have increased dividend in the first year of the prior five years of review for dividend growth. This rule does not apply for current index constituents. The list currently has 75 Canadian dividend stocks listed with companies varying vastly in market capitalization. The Dividend Aristocrats list can be a good list to start researching investments but the 5-year of dividend growth requirement is not a guarantee for dividend stability. Considering, a one cent dividend growth also qualifies any company, it’s important you look a little further to narrow down the list but a good start nonetheless. Are you looking to get average returns from the dividend aristocrats index or to find a gem in a haystack? This is where it gets interesting. You can purchase the dividend ETF index tracking the Canadian dividend aristocrats to keep it simple. 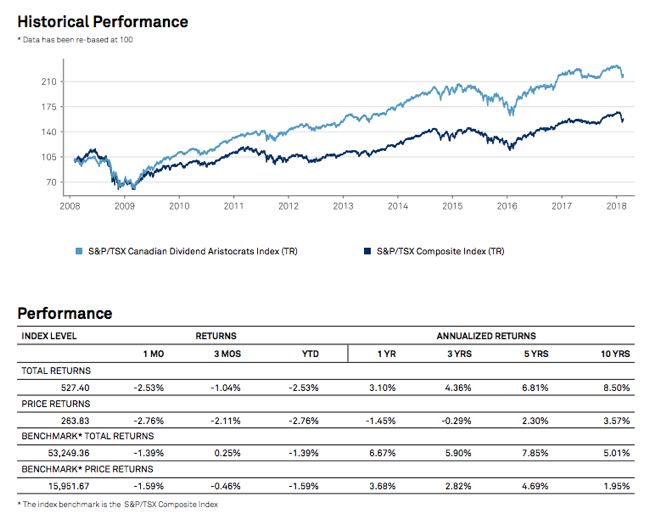 BlackRock offers the ISHARES SP TSX CDN DIVIDEND IDX FD TSE:CDZ (a.k.a Claymore S&P/TSX Canadian Dividend ETF) exchange-traded fund covering the S&P list. It can be a good choice for some accounts such as your RESP account. On the other hand, would you really own all of the stocks in your portfolio? Assuming you have some rules on how many stocks you hold, you will want to find the top dividend growth stocks and as such, the list is a great start to finding core blue chip stocks. Below is the cash distribution from the ETF. As you can see, it’s not providing a consistent growth even though all holdings should be increasing their dividends annually. The capital gains from removals and exposure control come into play when it comes to the fluctuating distribution. Investing in a select group of stocks might be better than buying the ETF as a whole. 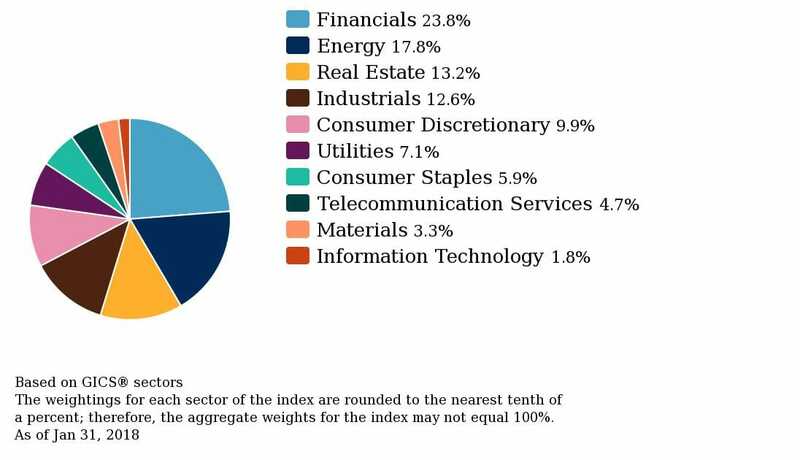 The sector diversification of the list is outlined below and just like the TSX, Financials, and Energy lead the way. Would the breakdown below match the diversification you want for your stock portfolio? Nevertheless, you can find some solid dividend growth stocks in many of the sectors. Below are the 87 securities listed in the index as per the rules outlined above. Before you go and agree or not with the index or the rules, indexes are put together to attempt at categorizing certain stocks and investment strategies such as monthly income investing, dividend investing or dividend growth investing. ETFs and mutual funds then use those to put products together to satisfy investor demand. January 2019: ALA was removed after the dividend reduction and ENF was removed as it was acquired by ENB. September 2018: A couple of stocks were removed and one was acquired. CJR.B and CIX were removed and PJC.A was acquired by MRU. February 2018: The following stocks are added; BEI.UN, EQB, TIH, PBH, RNW, PKI, SES, ONEX, and OTEX while the following 9 stocks were removed; FCR, RCI.B, WJA, SCL, IGM, PSI, CMG, NVU.UN, RUS, and ESI. January 2018: Agrium is removed as the companies merged with Potash to form Nutrient. September 2017: HCG and AIM were removed since they reduced their dividends. May 2017: 1 company was removed. Nevsun Resources (TSE:NSU) was removed from the list. February 2017: 14 companies were added while 1 was removed. Newcomers are: ALA, AP.UN, ARE, BAM.A, BEI.UN, BMO, CAR.UN, FCR, ITP, L, NWC, PPL, STN, and WN. BDT was the company removed from the aristocrat index in the last update.